Taking part in the round table were diplomats from Russia and from the Middle East countries, experts, journalists, and representatives of the public circles. 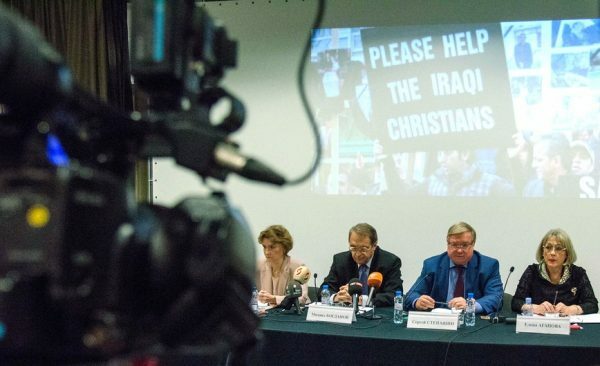 The Russian Orthodox Church was represented by Archpriest Sergy Zvonarev, DECR secretary for far abroad countries, who told the participants about the dire situation of Christians in Iraq and Syria and gave concrete date on the dechristianization of the region where Christians had traditionally abided. He noted the necessity of uniting efforts of the international community for protecting Christian presence in the Middle East and reminded the audience of the call contained in the Joint Declaration signed by His Holiness Patriarch Kirill of Moscow and All Russia and Pope Francis at their historical meeting in Havana last February. Archpriest Zvonarev thanked the Imperial Orthodox Palestine Society for humanitarian aid to people in Syria that it continues to render also together with the Russian Orthodox Church.